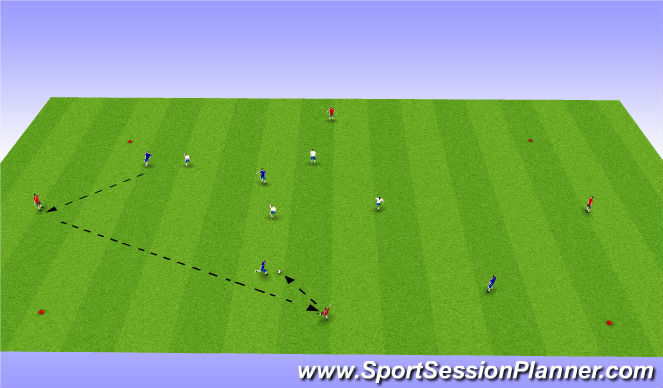 This session has been created to improve players first touch as it pertains to positive possession. Instructions: Players pass the ball, then run to the other side. 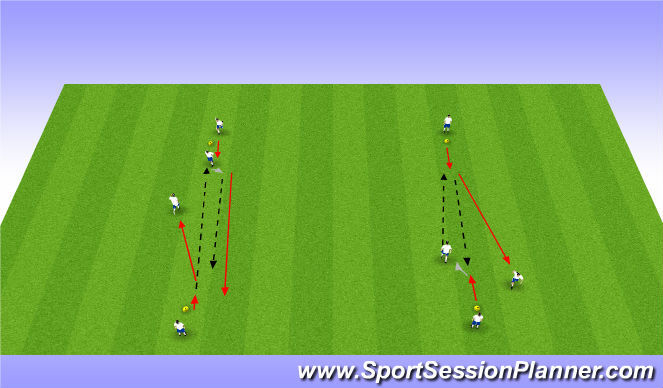 This is a 2 touch activity, and the focus is on the first touch. We will allow 3-4 repetitions for each type of touch, then switch to a new touch. (Types of touches-inside the foot, inside the foot pass. -outside the foot, inside the foot pass. -inside the foot, use laces to pass. Then Repeat). Depending on the age group, you can add dynamic stretching inbetween cones. Coaching Points: Proper weight of first touch, First touch going into forwart/side space, reducing the time between first touch & the pass, deception before& after the first touch. Organization: 30 x 40 grid, 3 equal teams (the neutral team is on the outside of the grid, the other two teams are on the inside of the grid). Instructions: Teams play 4 v 4 + 4 (If there is an odd player out have them become a neutral player on the inside of the grid). Goals are scored if a player uses their first touch to go through a gate. Neutral players can’t score, and players cannot score on the same gate twice in a row, Play 3 minute games, and the losing team rotates with the neutral team on the outside every game. Coaching Points: 1-Spatial awareness – position in relation to gated goals. 2-Know where to put the ball with your first touch to ensure an easy pass can be made. 3-Deception before, and between passes. Organization: Split teams evenly, and play an unrestricted game.